New York-based Amy Lau has often said she “curates” spaces. With a master’s in Fine and Decorative Arts from Sotheby’s prestigious Institute of Art, and a stint as the director of design at the Lin-Weinberg Gallery under her belt, it’s an apt way to describe the art connoisseur’s impeccable interiors. The designer founded her eponymous firm in 2001, and then co-founded Design Miami, which she brought to fruition with her partner, Ambra Medda, in 2005. She has been recognized as an AD100 designer, and received an honorary doctorate from the New York School of Interior Design. 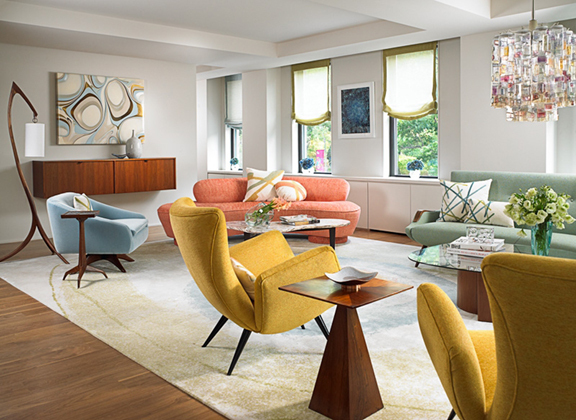 Amy translates her keen eye through a modernist lens, incorporating sleek, colorful mid-century pieces that are as livable as they are, like art, beautiful to admire. As a child growing up in Northern Arizona, I had a heightened relationship, bordering on a dialogue, with my immediate surroundings. I was impulsively drawn to this color or that material. Certain spaces affected my mood and sense of well-being. When I trace my early affinity to nature and see it evolving into my current relationships with craftspeople, clients, design professionals, and artists, there’s an obvious trajectory, as if my life has come full circle. Without realizing it, my life experiences conspired for me to become a designer. One of my prized possessions is a “one off” chair I designed with the legendary Vladimir Kagan, that’s in my current apartment. I own a set of dining chairs from contemporary Irish woodworker Joseph Walsh, as well as a lighting fixture from the Wiener Werkstätte period. I recently purchased an apartment in the historic Alwyn Court building, which I am currently restoring. The famous woodworker Michael Coffey and I designed a Mozambique hand-carved fireplace as the centerpiece for my apartment. I consider it a bit of both. While designing a space I embrace both art and design, enlivening and giving warmth to each personalized space with dynamic mixes of antique, vintage, and contemporary pieces, as well as site-specific commissions. As both a design curator and interior designer, I also look towards the future, commissioning one-of-a-kind works and installations by emerging talents and living legends in the worlds of art and design, with the potential to become tomorrow’s heirlooms. I conceive my interiors as a total work of art, so every piece in an environment has a supporting role within that space, so all is in harmony. The lighter the color on the walls, the airier the space will appear. My trick is taking a client’s favorite color paint, mixing it half and half with white, then painting the ceiling and trim with the newly blended color for a slight contrast. This creates a monochromatic palette that expands the room. I really listen to my clients’ wants and needs. Scale and proportion should be factored into any space you create. Choose pieces that are timeless rather than trendy. My motto is “curate to decorate”. I like to ensure every item has a purpose and each object adds a layer. Objects that tell a story are often the most interesting, and certainly the most valuable, so when I furnish a home, I approach the assignment as both a curator and a decorator. I will often be inspired by a piece of artwork or a rug. Functionality is a must, but before I preoccupy myself with intrinsic value, craftsmanship, artistry, and form, I pose the most important question: Will this piece speak to my client? Will it satisfy her tastes? Will it reflect his interest? Objects that resonate invariably have a talismanic energy that’s palpable. Holding a master’s degree from the Sotheby’s Graduate Program in American Fine and Decorative Arts, I am very passionate about Sotheby’s. While studying there with leading curators, art historians, and industry professionals, I honed my curatorial eye and deepened my passion for design. Sotheby’s Home distills all the knowledge of its talented staff onto a beautiful interface, and is a reputable source for very special pieces for very special homes. Shop Amy’s favorite Sotheby’s Home picks!